Even if I am Japanese and certainly love most Japanese food, I don't like all Japanese food. And I must confess that I am not too fond of a lot of traditional Japanese sweets that are based on sweetened beans. For the most part they are way too sweet for me, and if I make them for myself I'm always adjusting the sweetness level, as with my ohagi or botamochi. You will probably see the dango just plained boiled more often than not. But grilling the dango makes them taste much better, in my opinion. Many people have written in over the years wondering about substitutions for the two rice flours, which are the traditional flours used to make mitarashi dango. I've suggested a couple, but this recipe really does work best if you can locate the flours here. They are very commonly available in Japan, and any well stocked Japanese (as in JAPANESE, not generic Asian/Chinese/Korean) grocery store should carry both - or, at least they should carry the shiratama-ko. Another reason some people have trouble with this recipe is that they do not follow the instructions! Do read through carefully and follow them. You must adjust the consistency of the dough and knead it until smooth before cooking. If you don't do this you are going to have hard dumplings or ones that disintegrate in the water. Follow the instructions! If you can't do that you will fail. Thank you. 2 kinds of rice flours are used here. The combination makes a dumpling that is chewy and bouncy but not too sticky. Joushinko or Johshinko (上新粉, sometimes spelled Jyoshinko) is made from regular Japanese rice (uruchi-mai). 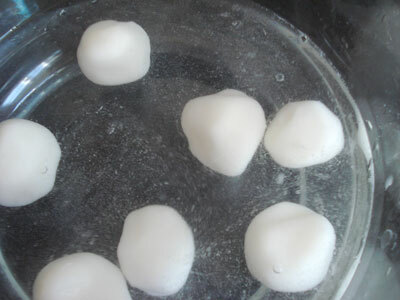 Shiratamako (白玉粉）is sweet or glutinous rice flour, or mochiko, mixed with a little corn starch or potato starch. 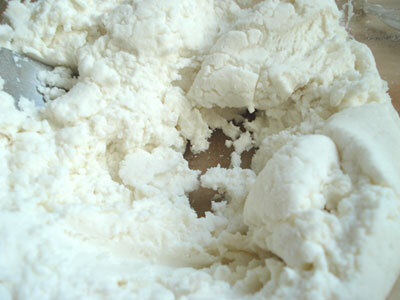 If you can't find shiramako, you can use mochiko with about 1 tablespoon of cornstarch or potato starch flour added. You can find all of these flours at a Japanese grocery store. You might be able to find them at a health food store too, since rice flour is more popular nowadays as a gluten-free thickening agent for sauces. The hardest part of this whole recipe is finding the two rice flours. Look for them at a Japanese grocery store - a general Asian grocery store may not carry them. You must use rice flour. Wheat flours or other grain flours will not work! (Edited to add:) Can you use all mochiko? You could, but the dango will be of a different texture, gooey and hard to mix up. Please do try to find the non-glutinous type of rice flour to add to mochiko. I have seen both kinds sold at many Chinese grocery stores, so it should not be that hard to find if you have access to a Chinese or general Asian grocery store. [UPDATE:] I have revised this recipe to use ml ONLY, to avoid confusion, since 1. cup sizes differ depending on where you are (in the U.S. 1 cup = 236ml, in Japan 1 cup = 200 ml, in the UK 1 cup = 250ml. Please use a cup with ml measurements on it to have better chance of success. Please note that the ratio of flours to water is the most important thing! You want 2 parts joushinko or rice flour made from medium grain rice, 1 part shiratamako or mochiko (plus 1 tablespoon cornstarch or potato starch in the case of mochiko), and 2 1/4 parts water. Always add the water gradually until you have the right doughy consistency! Once you have found the rice flours, the rest is a breeze. This amount makes about 25 dumplings (5 skewers). Mix together the joushinko and the hot water. Add the shiratamako. Mix until it forms a soft dough that feels a bit dry to the touch. It's a very pleasant dough to handle. Divide the dough into 25 pieces (you can do this by forming a long log and cutting it, or just divide it up in the bowl and eyeball it). Make each piece into a little round ball. It doesn't have to be perfect in shape - a little bumpiness is fine. Bring a pot of water to a boil and add salt, as you would for boiling pasta. Add the dumplings a few at a time to the pot. After a few minutes, the dumplings will come floating to the surface. Boil for a further 3-4 minutes, then scoop out with a slotted spoon or similar. Immediately dump the dumplings into a bowl of cold water. Put the dumplings on skewers, 4 or 5 per skewer. Try to pierce the dumplings in the middle. Grill the skewered dumplings on a grill or a grill pan, turning several times, until nice burn marks form over them. 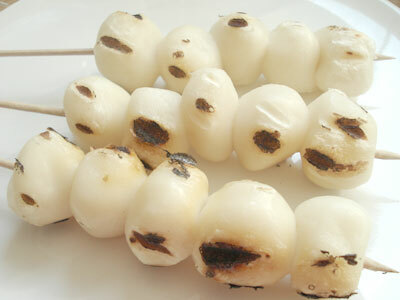 Here are some finished grilled dango skewers. While you're grilling the dumplings, make the mitarashi sauce. Combine all the ingredients for the sauce in a small pan and bring to a boil. Cook until the sauce has thickened. The more it cools, the more viscous it will get. You can make the sauce in advance too. Pour the sauce over the still warm skewered dumplings. They are best eaten right away, but you can make them in advance too, as long as you bring them to room temperature before eating. You may have seen these with a sweet azuki bean paste on them. I don't like them that way, but if you do, you can use this tsubuan recipe, perhaps mashing up the beans a bit more to make it smoother. Plain maple syrup is a nice sauce for these too, if not too traditional. Submitted by maki on 2008-02-26 14:28. I have been wanting to try dango for a while now. Bookmarked to try. LOL. I just bookmarked it too. I don't even really cook but I gotta try this maybe during the upcoming weekend. I remember eating this dish as a little girl. South America does not offer the rice flour your talking about just the basic white one and that's it. But its nice to be taken back to those wonderful memories as a child. Definitely going to make those, thanks for sharing your recipes! You probably need less water. Try adding it little by little and mixing it between additions, and stop when it gets to the right consistency (a dough you can easily knead). There is a similar chinese dessert eaten during winter solstice called "Tang Yuan", normally chinese eat them with sweet syrup/sweet soup but I noticed Japanese eat them with atsuki bean soup. Do you usually use the same flour recipe for shiratama and dango? they feel a bit different from what I've tasted. The Tang Yuan I made, I've only used the glutinous rice flour and thats it. But when I eat mitarashi dango I know its much more chewy and with more substance. One can get full just by eating dango. Yep that's why I use a mixture of flours in the mitarashi dango recipe. For anmitsu I use just shiratama flour (which is just sweet rice flour with potato starch), which are quite a bit softer. But I do know people who use shiratama only for dango - it turns out ok, if a bit soft. That is exactly my story. Thanks for the recipe, will try it soon. Oh, wow, I just stumbled onto this site, and I'm so glad I did. I lived in Japan for a few years, and I love these things. Never really thought about making them at home, but I am now eager to do so. Yum. Thanks for this recipe. I'm not used to dealing with rice flour. When I mix the joushinko, water and mochiko/starch mixture, it never reaches the consistency of soft dough - it says a sort of gelatinous liquid. Is the amount of water correct? Is there something about rice flour that I'm not aware of? This answer from me is probably WAY too old to be helpful for you, but I had the same problem today when following this recipe. To fix the gelatinous problem, I simply put in less water, and I slowly added the water while mixing it into the dough to make sure that things didn't get too soggy. Even then it was a little bit droopy and wouldn't form balls, so I put in more corn starch. They ended up coming out pretty darn good. My favourite Japanese dessert is the aburi mochi served at Ichiwa in Kyoto (near Imamiya Shrine). These Mitarashi dango really are the next best thing. I love them! They're great as they are, but my own variation is to sprinkle on a very light dusting of ground sesame (just a pinch or two). Memories of Kyoto then come flooding back. I've just eaten a portion of dango with a cup of sencha and feel a warm, delicious contentment. I'd never made dango before but by following Maki's recipe exactly my own batch came out just as she described. My own impression is that you haven't got the right rice flours for this. I had a little trouble sourcing my own yesterday, yet London's Japan Centre must be one of Europe's easier stores for this kind of ingredient. It's obviously not easy. The joushinko wasn't labelled as such in English. On the back it just said 'Rice Flour' ingredients: rice. On the front the only thing written in Hiragana was Mitake no (みたけの）then 3 kanji - 上新粉. Also I could see Dango written in hiragana in a corner. The shiratamako I had to ask for as it hadn't been unpacked yet. Tricky as I hadn't brought notes (impulse purchase) and couldn't remember the name. In English it said 'Rice Flour' ingredients: gelatinous rice flour, corn starch. On the front, in hiragana, is usagi (うさぎ) next to the kanji 白玉粉 - the kanji on this packet is so stylised I personally can't read them, even 白 (white - shiro) looks completely different. Maki, when I bought the ingredients the store assistant who had helped me find the shiratamako gave me a friendly warning that dango were hard to make. I appreciate your recipe - it really was a breeze! dango looks good..i havent tried it before..im not a good cook..and im not sure if asian stores here in my place sells dangos..i want to try one really bad..
Wow thanks, I saw this recipe in Samurai Champloo (thank god i'm not the only one) and I have to try it! But I cant find the flour...Anywhere... That might be a problem. Well... I am new in Japan and I am basically trying to cook anything japanese. I use to make Dango covered with sesame seeds, coconut and sugar. Filipino friends taught me the recipe but I know that it comes from China. I would like to know if this is considered Tang Yuan as well. If not, I would like to know the real name of it? I am definitely going to make "Mitarashi Dango", I love anything that involves Dango any ways. I love this website, it really shows the right way to cook japanese food and the pictures are a great addition by the way. I couldn't find mirin... can I make the dessert without this ingredient or is there a way to replace it with something else? I have plum wine and sake at home... do you think that might work? Sake with sugar (and maybe a splash of dry plum wine) might work, but it would be a pretty inadequate substitute, I would think. I finally made "Mitarashi dango" today. It was so EASY! I think the hardest thing was washing the grill pan, seriously. I used the plum wine and it was really good. I don't know yet how it taste with mirin, but I will very soon. I did have to add more shiratamako to the mix in order to get the right texture, but it came out perfect! Thank you very much for the recipe it was nice eating something like that with such a rich flavor but at the same time the burn marks really make it. I have left overs though and did not have an idea what to do since you say you have to eat it right away while they are warm, so I just put them on a plate with saran wrap in the fridge and plan to warm them up in the toaster over tomorrow and see how they taste like. I was sure to find this recipe here ;) I ate mitarashi-dango last week in a real japanese restaurant and then I'm obsessed by finded the recipe to make it at home ! 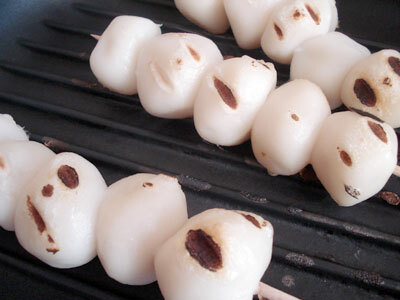 Does "glutinous rice flour" alone is enough for making the dango ? I'm not sure how Chinese 'glutinous rice flour' compares to the Japanese rice flours, but you can sure give it a try and see how the texture is! I won't mention the name of the book, unless asked, not sure if I should... but i'm pretty disappointed in it...seems their instructions for amounts and things are off....like they said use 2/3 cup Jyoshinko + 2 Tablespoons sugar + 1 1/3 cup hot water. I did that and then it said to knead it, but that was impossible because it was so liquidy!!! So i added like the whole small bag of Jyoshinko trying to thicken it up, added some more sugar too. Then it said in a separate bowl to use 1/2 cup Shiratamako + 1/4 cup hot water, that turned out well, like what it's suppose to be, dough-like. Then it told me to add it together. I tried to knead the two together, but the gooiness of the Jyoshinko overpowered the doughiness of the Shiratamako. I realized since i had increased the amount of Jyoshinko that I should also increase the Shiratamako, so I did, helped a little. So I was able to use spoons to form round like balls to drop in the boiling water, after they were floating i removed them. They taste ok but then again, my experience with dango is limited and never had homemade ones. Me too! Same book same issue! I didn't even get it to make balls! Now I ahve a plat full of cooked syurpy rice T.T It ruined my snowday! Now I will try to amke theses w/ what I ahve left. Tomorrow. Oh my goodness, I looked all over for a recipe for these but I had no idea what they were called until I went through list of 100 Japanese foods to try (I just called them mochi on a stick with almost teriyaki sauce). I've always bought mitarashi dango in frozen form (with the sauce) at my little Japanese grocery store and let them thaw out. I'm really excited to try to make these on my own now! Thank you thank you thank you! I am acctually going to make these for a bakesale! Do you add the cornstarch to just the mochiko or also the shiratamako if you decide to use it... i mean it kinda makes it sound like you should only use the cornstarch if you have to use mochiko... any help? Oops...I forgot to answer this one. You just add the cornstarch if you're not using shiratamako (since shiratamako already has potato starch (katakuriko) in it). Very nice recipe, i have not tried it yet though. If you need help finding any ingrediants on that list just go to www.ichibajunction.com they have everything on that list except the skewers/bamboo. All of it cost about $20 :D.
Hmmm could this be a sub. That seems to be a glutinous rice flour, so it would be a substitute for the mochiko. See if they have a regular (not 'sweet', 'sticky', 'glutinous' etc) rice flour. I've edited this article to suggest more easily obtainable (probably) rice flours for johshinko and shiratamako or mochiko. I've seen rice flours on Amazon.com if you can't find them locally, but try a local Asian grocery or health food store first. Wheat flour is NOT a workable substitute for this btw. When I was trying to make these, I tried two times and the dough was way too watery. I realized after the first time that 220 ml is actually only barely more than a cup, not so much 1 1/2 cups. But even with just a cup the second time, it was still too much. So the third time I only used 1/3 cup with the rice flour, and then added the glutinous rice flour. After that I gradually added more until it amounted to somewhere between 2/3 and 3/4 cups. I even had to add a tiny bit more of each flour. So, if anyone else is having the same problem, I'd just suggest starting off with a lot less water and adding more until the consistency is right. If it worked for everyone else, I don't really have any idea why I had this problem. But when I finished them after the third try, they were delicious! The only thing I would suggest changing is the amoung of soy sauce and switching the amounts of rices Mochiko rice makes the dango fluffier so I'd use more of that instead of Jushinko and too much soy sauce makes the sauce very dark not like traditional, but maybe that's just me with the soy sauce cause the picture looks correct. but definately too thick a dango with the portions of rice flour here. Thanks for the tip about Ichiba Junction! They had all the stuff I needed! I'll tell you how my dango turned out when I make it!!! I ate these about 10 years ago at a shop in Okinawa and loved them so much! I have had dreams about having them again but didn't know how to get them, so glad I found your recipe! Thank you so much for this recipe! This was my comfort food while I was studying abroad in Japan and I've been craving these ever since I got back. Thank you, thank you, thank you! i'v wanted to try this for ages so thank you for uploading the recipe. but i live in england so i can't find some of the ingedients. Hayley, from the information received from Just Hungry readers, there aren't any Japanese grocery stores in the Birmingham area. But there are some general Asian stores - see this page (sorry it's a bit of a mess at the moment, I need to edit it, but the info is there). At a general Asian/Chinese store, you can find 'glutinous' or 'sweet' rice flour, and regular (doesn't say 'glutionous or 'sweet') white rice flour, and use those. 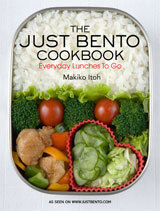 Otherwise, you may need to order joushinko or jyoushinko and shiratamako from a place like Japan Centre. I made some, it was good, I used white rice flour and Mochiko with Corn starch. The sauce was great too, I was amazed at how quick it thickened. It turned out pretty good and my chinese friend loved it as he made it with me. Now i get the idea of adding a little sugar and salt to the actual dango as it is a desert dango, make it less bland, probably through dissolving it into the water needed to make the dough i'll see how it goes. へへ Also another idea is tiny bead sized Dango on toothpicks for hour d'oeuvres. I might try it anyway with these, but I wanted your opinion. Thanks for your help! hi Beth, the Glutinous one plus the White one should work. 粉　just means flour or powder by the way. Thank you so much, I'm excited to try these! I studied abroad in Tokyo 6 months ago and I always, always ate mitarashi dango. When I traveled around Japan, I made sure to eat mitarashi dango whenever I encountered it (I had the best dango while I was in Osaka!). i tried my best but the only thing i got right was the sauce. i added more glutionous flour and it became the cosistancy you describe. I don't do video at the moment. Besides, I doubt it will help! Try following the instructions __as they are written__ (my feeling is you did not boil them long enough). Almost everyone else who's tried it seems to have had success after all! 1 cup of flour = 1/2 cup of water. I was try something out because I have to teach a chef to do dango for a Anime convention.Something easy for them to calculate. and 4 cup of hot tap water. Althought you have to cook much longer before it floot and after floot (my experience took 9 min to floot and I say around 7-8 min after floot depending the size of the ball). Rice flour is longer to cook. 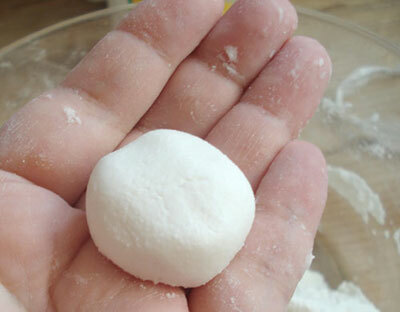 If you add 1/2 cup less Rice flour and 1/2 more Glutinous flour, you will have more chewy dango. I call this easy portion to remember. I was try something out because I have to teach a chef to do dango for a Anime convention. Something easy for them to calculate. Althought you have to cook much longer before it float and after float (my experience took 9 min to float and I say around 7-8 min more after it float depending the size of the ball). Rice flour take longer to cook. If you're using glutinous rice flour, does it make a difference if you use cornstarch or not? can you substitute both joushinko and shiratamako with mochiko? What if I used the kikkoman kotterin mirin sweet cooking seasong instead of mirin? Hello Maki, must I use Japanese soy sauce? Can I use Chinese light or dark soy sauce instead? Does it matter if I did not grill the dango (omit the whole process) or can I bake it instead? (It will be great if you have the alert delivered to our email inbox when somebody replies to the question..just a suggestion ! Sorry for the influx of comments ! You can use Chinese soy sauce. There will be a small difference in flavor, but perhaps you wouldn't notice it if you haven't compared them. You can just omit the grilling part. I wouldn't bake them - that would probably dry them out too much. Fantastic recipe! I made some for my friends and I and they were quite the hit. They turned out better than the dango we'd get from Mitsuwa - especially the sauce. Since I didn't have mirin, I found that cooking sherry with a pinch of sugar works as a good substitute. I tried making this but I wasn't too impressed. The sauce was too salty for my taste and the dango was very dense. Maybe it's because I had to use rice flour and mochiko since no stores here sell the right flours. I'll just have to try the dango in Japan and see how that tastes. I have been intrested in sharing some of these recipes with my friends but I have to travel with them so they wont be freshly made, can they be chilled and how would they taste, the last thing I want is my friends being put off trying anything else new. I've wanted a recipe for mitarashi dango for so long. I'm so glad I finally found one. I got hooked on then when I was living in Tokyo, and have been craving them ever since I came back to Australia - which is years ago now. I did find already made, pre-packaged mitarashi dango at the Japanese grocery store in the city, but they're about $9 a box (of 3 skewers, with three dango on them). Thanks a lot for posting thi recipe - I look forward to making them sometime today. I too am a Samurai-Champloo fan and had seen these on there as well! I'm glad to know I can now make them and see how they taste. Although I will want to try the soy-sauce version and then the one with the glaze. Just to compare and contrast. As a side note, one of the local Chinese resturants had these little sesamee balls, which I think are close to these in the way they are made. (I think, and say this because I have not cooked these yet so I can't make a comparison) Although I think the resturants little balls were maybe a bit hollow inside, but definatly had sesamee seeds all around it inside the dough even. Kinda made me think of that when I seen these on this website. Anyone happen to know what I'm talking about are am I just shooting blanks?!? A friend told me the sauce taste great with a bit of finely crush young ginger in it! She said it s not her invention, so have you ever tried with ginger? I make these all the time with ginger syrup. It's super easy and works with dumplings boiled or grilled, bean paste-filled or plain. It's just a simple syrup: 1 part water 1 part sugar, plus ground ginger. You can vary the ratio to taste, or just infuse a piece of ginger then take it out. It's really the easiest sweet recipe there is (and a great way to get rid of leftover bean paste). The sauce is extraordinarily yummy! 1. I couldn't grill the dumplings as I didn't have a grillpan or skewers handy (perhaps that's why I don't like the bland taste). I would like to ask, can I grill the dumplings whenever I want? Do I have to brush off the sauce first? 2. Some more about rice flower: Other than the glutinous kind, I have two types which are both called 'rice flour': one, which seems to come from India, smells and tastes exactly like uncooked rice would taste, and perhaps slightly coarse, and the other one smells very perfumy, maybe like jasmin smell, and it's very finely ground and seems to come from Thailand (despite the perfume, it doesn't list any other ingredient). Is there any difference between the two, and especially, which one would give the best result? The dumplings are grilled BEFORE the sauce goes on. 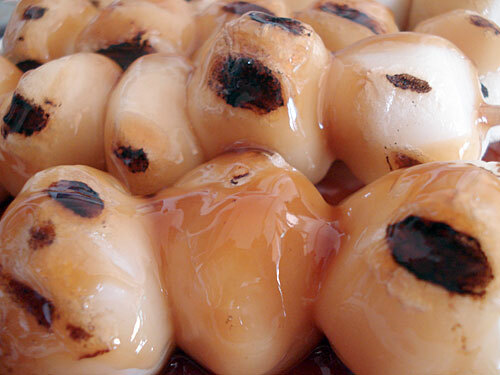 You should grill them reasonably soon after they are poached in water. Neither of the flours you mention will give 'authentic' results, but you can certainly experiment with them. I don't know how they will turn out though! Thai rice is just a variety that has a very particular smell, there is nothing added to it to make it smell like that. In this case it is really a syrup. It had a surprising taste, almost like a very low grade* maple syrup from New England. It is good on pancakes too. As I have stated in the article, just using mochiko (i.e. 'glutionous rice flour' may not work well. Please try following the instructions - they are really tested to work. My friends epicly fail at making dangos. They've each tried a different recipe but each one tasted like crap. So now it's my turn, and I'm really hoping this recipe works. do you think frying the dango instead of grilling would be good? Thank you so much for this post! I've tried making mitarashi dango a few times already, but since I didn't mix the flours they always ended up with this awful snot-like texture. I was never able to find anything describing the proper texture of the dumplings, so I just assumed that's how they were supposed to taste and gave up. That said, I can't wait to try this recipe! But as it turned out, to my abject shock, they had a very satisfying texture and the sauce was delicious. Next time, I think I'll make them a little smaller and try grilling them. In making them, I had the same problem that a few other people had, namely that the dough, using only what I could find that was labeled 'rice flour,' turned out very gooey with the amount of water suggested in the recipe. I just dumped in a little more rice flour until the dough got to the right consistency (I do this all the time when I'm making bread as well, as humidity varies widely where I live) and the dumplings turned out fine. I got a few more balls than I really wanted because of this, but I imagine that restricting the amount of water will work just as well. I'm not sure mine came out right. All purpose flower for baking cakes and cookies and such in america is the same thing as joushinko right? O.o Few places said so but I'm really not sure as I'm not used to cooking much of anything with flower pretty much ever. As far as the mochiko it was easy for me to find, military base commissary has stuff like that from many places. Though I didn't see anything called joushinko so I might try looking again or just order it online. Anyway, had issues with the water much like a few others it just kinda became a runny paste so I tried multiple times. Thought I finally got it so I boiled them. They didn't float... at all. Dunno if they were too big? But I'm betting it was the flower. Grilled em anyway, they were really really chewy. Tested em on the husband lol! He said they were good but I still doubt I got it right. Sauce wise, it was easy and it tasted good. Hubby said the idea of sugar and soy sauce sounded grose but after he tried it he said it tasted a bit like regular pancake syrup. Anyway with the flower thing I'm still not sure if that was the right thing to use. Any suggestions apart from ordering it? Or was it ok to use that? Joushinko and all-purpose flour are not the same thing at all. All-purpose flour is wheat flour, and joushinko is rice flour made from medium-grain rice, while mochiko is rice flour made from round sticky rice. If you can't find joushinko, try finding something just labeled 'rice flour' at an Asian (Chinese) market or even a health store that caters to celiacs. Good luck! I admit I tried this recipe on whim, but I'm not sure if my results are correct. I couldn't find the specified rice flour you suggested, so I substituted with glutton and non-glutton kinds respectively. Also couldn't find any mirin for the sauce, but I'm okay with the result. Nice recipe, I finish cooking it about two hours ago. I don't really understand why you use that amount of water for the sauce. Since you want it thick, you could use less water and save time (the sauce thickens because the water evaporates). 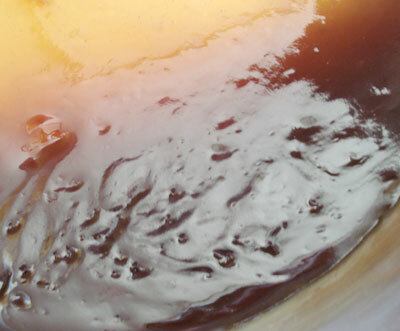 The sauce thickens because the starch cooks and becomes viscous in the liquid. The amount of water allows the starch to cook properly. 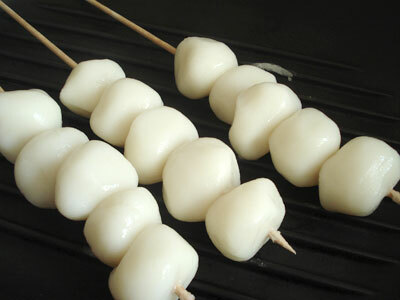 As i am typing this i am actually making my second try at making dango. I'm having a slight issue tho. So far the baöös i have made refuse to float. The first try i did as actually quite tasty even tho the balls wouldn't float. Would it be possible to get some average time on how long it takes for a ball of about 1 inch in diameter to start floating in the pot. I'm quite sure the reason why I am having issues is because of the riceflour i use. As i have not yet found any local shop that keeps anything but a "plain" no-name riceflour. Average time before balls should float would be helpfull. Thanks! For me they usually float up to the surface in about 4-5 minutes. It could be that you are overcrowding the pot and/or the dumplings are sticking to the bottom. Try gently loosening them if that happens. I also don't salt the water, though that shouldn't change the floating issue any. ETA: Now I read your question through, I've noticed that you say your dumplings are about 1 inch in diameter. Try making them about 2/3rds that size. Secondly, I noticed you said u don't salt the water but in the instructions above, you mentioned 'Bring a pot of water to a boil and add salt, as you would for boiling pasta.' - so my question is, is adding salt just a personal preference? they're around 2/3 of an inch diameter. Thank you for your great recipe. The key component of the boiled dumplings is a content of starch in the flour (two flours in your case). If too less starch, the round balls will be stone-hard. If too high content, they will fall into pieces while boiling. The only difficulty is to be perfectly in-between. I like the traditional mitarashi which comes excellent with potato dumplings as well. I think that it was not the size that caused the posted problems, but starch content. Thanks for the recipe once more! Thank you for your long comment Beate. I do have to correct you on one thing however; the mitarashi dango in the picture you pointed to is less than 1 inch in diameter when rounded (it may look a bit more since it's flattened). I should know since that's my hand and I made them :) Making them a bit too big may cause problems for the impatient. I have had this before, I prefer it over the ones with the bean paste on them. I found it at a japanese market around my area. In response to my previous post...It worked! I used almost exactly .75 cup water instead of 1.5 cups. I added in about .5 cups into the shinko, that wasn't quite enough, so I added in about 1/8 cup and that was good for the shinko. Then I added the mochiko w/potato starch along with another 1/8 cup. Nice texture :) and the sauce was great too, it thickened up to where I wanted it about the same time I saw the first bubbles rise, really quick, and tasty. Awesome website. Thank you!!! I have been wanting to make this recipe for such a long time and today I finally tried it :D.
I couldn't find the exact flour ... I think. What I found at a korean market was flour labeled Rice Flour and Sweet Rice Flour. So I used that and added corn starch to the Sweet Rice Flour. I measured the rice flour and added the listed amount of water, then dumped in the Sweet Rice Flour and corn starch. Like others have said, I had soup! not dough! Do'h! So I added another 1/2 cup Rice Flour and 1/8 cup Sweet Rice Flour and 1/2 tbs of corn starch. It immediately came together in a dough, though I think it was still a little more wet than it ought to have been. While I was rolling the dango it was still really sticky, so I covered my board and hand liberally with the sweet rice flour. I made my balls about 1/2 inch in diameter and with the added flour this ended up making about 45 dango. I had two or three of my first ones that ended up being huge so if they were all the same size it would have been 50 dango. They were chewy and pleasant in texture (yay!) Made the sauce as directed and it was wonderful. I really liked the added texture of grilling them. Next time I will cut the water I add in half, and then add it in gradually until it has a good texture. dango is grainy...how do i fix this? so i have tried to make dango lots of times. i still eat it every time i make it but i feel like the texture is still funny. i use mochiko and joushinko together with the corn starch, knead the dough a bunch and boil them. they just dont come out chewy like mochi or like the dango i buy at the store. the texture inside is grainy and kind of dry sometimes. what am i doing wrong? am i just not boiling them long enough? i really get frustrated sometimes...even when they are cooked all the way through they are still grainy. should i smash the dough more? :( help! Mmmmmmmmmmmmm oishii thank you for this yummy recipe!!!! although i had the same problem as Alifay but i doctored it and it turned out great it was a lot easier to make than the daifuku i made the other day is there anything else that i could use as a topping such as black sesame i just have a lot of dango lol? 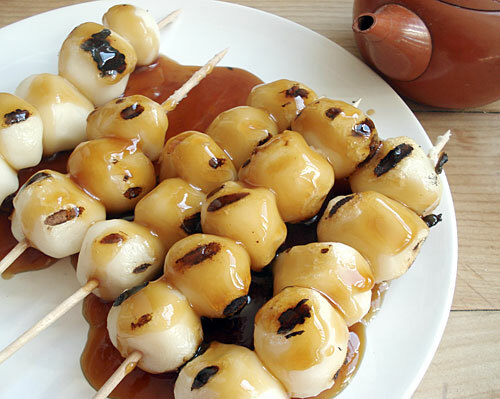 Omg this looks soooo good!I've always wanted to make dango for my family! Thanx! But I have a couple of questions....what is mirin? and rice vinegar? I just tried making this -- the water measurements do NOT add up: 1 & 1/2 cups of water is NOT 265ml. 265ml is 1 cup + 1 tablespoon. Beware when adding the water to this recipe! Start with 3/4 of a cup (190ml) and knead from there. I love these! your blog motivates me to make some! I love sweets but I don't like my sweets too sweet, if thats even possible haha. I have the same question as Tally, do we really need 2 pakets of diffrent flour to make the dough? What happens to the dough if we take one flour type out of the recipe? Also, what are some substistutes for Mirin, im a minor and I dont know if its an alchohal or not, like can I just use regular vinegar or does it HAVE to be rice vinegar? Ah, sorry for all the dumb questions, this is my first time making Dango EVER! Thanks for taking the time to read this, haha. I have no idea what shin mirin is (新みりん？）and shio mirin sounds salty. I always use hon ('real') mirin. Finally I found this recipe! Me and my friend wanted to make some. First time I ever heard of dango I was watching Tobi eat it. I read today that you could replace sweet rice four with tapioca starch (available at walmart.com) I haven't tried it yet, but I've never made dango with right ingredients anyway, so I wouldn't know if they came out right. Anyone tried this before? Or willing to try it and let the rest of us in no cultural diversity land know if it works. Tapioca flour may work as a sweet rice flour replacement as a thickener in sauces (which is how both flours are often used, especially recently due to the popularity of gluten-free-ing recipes), but absolutely will not work in this recipe. I just made these for the first time and they turned out perfectly! We have one Japanese store in downtown Toronto that sells them from time to time, and even my mom agrees that these look and taste exactly the same. It's great to know I can now reliably make them at home. that was a delicious-looking recipe--thanks! any chance you have a handle on exactly what kibi dango looked like, or tasted like? The ones Momotaro packed, of course. I've seen some examples that look like bars of mochi, and others that are a bit more "wagashi" looking, with kinako and rounded plump ball shapes. But I have a hard time imagining Momotaro got all his animal friends to go o ff on an expedition with sweets...unless this is an early example of the seductions of junk food...any insights? inquiring minds want to know!!! This was such an amazing recipe. I had so much fun cooking it. I couldn't find the exact right rice flours, so I had to use the ones they had at the local store. It came out watery, so I drained the water and added more of the rice and glutinous rice flours, and then it was smooth sailing. That mitarashi sauce made my day -- seriously. It has layers of flavor that unfold in your mouth with the dango... beautiful. Re: Mitarashi dango, same beginning ingredients as hanami dango? Thank you for the detailed recipe and information. Looking forward to making! Does hanami dango start with the same ingredients? Thank you! Basically yes, except that the dango (dumplings) themselves are flavored in the case on ohanami dango. The green one is flavored with matcha powder, the pink one with salted cherry blossom, and the white one with just sugar (sugar is added to the other ones too) plus a bit of vanilla essence in some cases. Is it ok if i just use the shiratamako and cornstarch only instead of both the shiratamako and joshinko? A friend of mine tried making dango once, but those turned out very hard, nothing like chewy. I want to try this recipe, I got a hard time finding regular rice flour from an Asian grocery store, even in Amsterdam I couldn't find a specific Japanese grocery store, let alone the specific flours. However, it's unclear to me if you mean Joshinko AND Shiratamako, or that you mean Joshinko OR Shiratamako. On an other note, is it possible to make regular rice flour glutinous using something like mirin? On another note, for the rice flour, I used sweet rice flour, but I don't know if this will affect the texture or the taste of the dango. I got confused on the rice flour I had to use, is it Joshinko AND Shiratamako or just regular rice flour? I can't find regular rice flour, just sweet kind. Thank you for recipe anyway. I was just confused on these two things, and I really want to make dango properly. The sauce is perfect, no doubt. The only problem I have is the lack of the two specific flours (Only have glutinous and non-glutinous). I did a searching for other recipes and came to this conclusion. If you only use glutinous, you get ridiculously soft dango which wasn't very pleasing to chew, for me. And if you use non-glutinous, you get the opposite. Very hard dango. In the end, I decided to do half and half with a total of two cups of flour (1 cup of non and 1 cup of glutinous). I added water by 1/4 cups (hot). In the end, I used about 5/8 cups of water. Result? Firm but chewy dango. Once you put the dumplings in the cold water how long do you leave them there for? Just a few minutes until they have cooled down. I'm actually eating these right now and they taste amazing :D! The Mitarashi sauce isn't too intense or sickly either, just how I like it. I didn't have any rice vinegar so I just put in 1/4 tsp of normal vinegar with 1/4 tsp of sugar and it worked great. I defo make this for my friends the next time we have a get together :D! Arigato Gozaimashita for the awesome recipe :D! These are horrible. Definitly not dango. The non glutinous rice flour make them too mealy and just not even close to what I have tasted with dango previously. I think I should have been deterred as soon as he said he doesn't like Japanese food and that dango was too funny for him. I should have picked up he was going to give me something like this. Old nasty comment! I guess I was not paying much attention when I let this through. I'm sorry the recipe did not work out for you, but you probably did not follow it right in the first place. It has worked well for many people. And did I say I did not like Japanese food? I said I did not like ALL Japanese food, but I certainly do like MOST Japanese food including mitarashi dango. And, when I make them, following this recipe, they turn out perfectly. I tried making this recipe and it came out chewy and yummy!! Instead of using non-glutinous rice flour, I combined the glutinous & mochiko + cornstarch. Since I don't have rice vinegar, I used cane vinegar. Somebody asked if you can fry the Dango balls, my answer is Yes!! My grandmother deep fries the glutinous rice balls and pours caramel sauce / syrup over the skewered balls. its quite hard to find rice flour in my country because no use practically uses it , i live in "libya"
so i need to ask does it work with plain grounded rice ?! i've been wanting to make this for a while, and i was wondering how to make it. fank chu for making this recipe! I lived in Japan until I was 5, and I can't remember much, but this brings back distant memories....looks really nice. Can I flavour it with matcha powder? Will it change the texture? Yes you add the mochiko after the joshinko + hot water. This is a snack - the concept of dessert didn't exist in traditional Japanese cuisine (though these days some people do enjoy dessert after a meal). There's nothing preventing you from serving it as a dessert of course, but the mitarashi sauce may be too salty for many people who expect something that's purely sweet. 2) I'm planning to bring this for my class and I was wondering if you have any suggestions for making ahead. Would the sauce keep well in the fridge or should I just make it the day of? How long will the dango keep in the fridge? 1) In this recipe I've used volume, so go by volume. You can use the same measuring cup and weight out the dry ingredients first and the water later. But add the water little by little and STOP when it reaches the righ consistency anyway - as with any kind of dough, if it's very dry or very humid the amount to be added will change slightly. 2) The sauce can be made ahead, and heated through with a little added water if it's stiffened up. Re: Mitarashi dango: Silken tofu? How do these compare to Tofu Dango? They look like two versions of the same basic dish, but I'm not sure how different they are. Do they have different textures? Do you prefer one or the other? Or are they simple from different regions? Or maybe the tofu version would be an option if I can't find joushinko: I've never had a problem finding silken tofu, in different cities across the US & Canada. As I have said, before making these, I had never really tasted odango before. Therefore, I'm really not sure if they came out right. My suspicion comes from blind delusion that everything Japanese must be delicious. Which in my case was not. I didn't like the mitarashi sauce but since, for various reasons, I used another recipe I won't complain. But I don't think I like the "sweet&salty" idea very much. My dumplings look fine but I don't really understand what the real texture should be. All I could find describing it is "chewy" and mine are chewy, alright. It's not dry or anything. It just tastes like... cooked flour balls. You can really taste the flour in them. My mom compared them to Polish dumplings and said that the Polish ones taste better and these are just... I suspect I might have overboiled them because it took them a long time to reach the surface. But does that really change the taste so dramatically? Like, from fantastic, famous odango to embarassing ko-cooked-flour-balls. Oh, the 2 types of flour I used were all I could find in this corner of the Earth I live in: some kind of Chinese glutinous rice flour and a local kind of unlabelled rice flour, which I suspected had to be non-glutinous. Hi love all that you've done & I enjoy using your recipes. I've tried dango before so I know that the texture shouled be ever so slightly chewy yet soft & easy to bite through. The multiple times I've made it the dango comes out very dense & heavy, nothing at all like I tried. I swear I've been following the instructions to the letter! Even managed to find both kinds if rice flour (miracle in Egypt). Do you have any ideas on what could be wrong? You've never written what kind of texture to expect so for all I know, I might be making the dango as you intended. Btw, the sauce.. OMG!! Is that good! I can imagine it would do very well as a marinade for chicken too. Im not sure if I can be of much help considering that you posted this a month ago but I've found that adding Tofu to dango makes them softer but this calls for a different recipe which Im not sure is authentic but if you're interested it calls for equal parts Silken Tofu (you can also use firm tofu but I haven't tried this myself so Im not sure how it'll come out) to Shiratama ko/ Mochiko (either plain for chewier Dango or with some potato or corn starch for some substance and to make them a bit less stickier I think).I think about 200 grams tofu with 200 grams Glutinous rice flour (with a table spoon or two of potato/corn starch if you want to add it) should work. If you don't have a scale like I did try around a cup of the flour with around a cup of the tofu and mix them together. If the dough is too sticky or wet add more flour and if its too dry and crumbly try more tofu or water, the dough should have the softness of your earlobes and once you reach this consistency just roll them into balls and boil as you would normal dango / the dango in this recipe. I'm trying to make the sweet dumplings that have the black sesame seeds in and I'm using normal rice flour.. 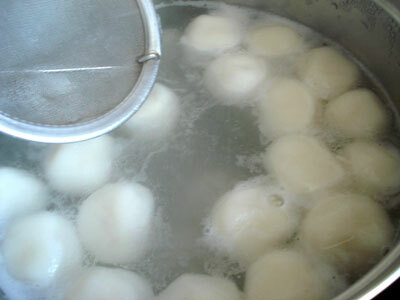 Mine don't seem to float to the top when I boil them and they stay very hard and floury..
Could you perhaps help me? In South Africa we only get one type of rice flour and it doesn't say wether is glutinous or not..
Where can i get all the supplies i need for this dish? Can you freeze them before grilling? I had to make them in a normal frying pan, but they still turned out great! I'll be making these tomorrow. Most baking needs aisles actually have the sweet rice flour as a gluten free alternative and the usual Goya aisle or international aisle in most stores has regular rice flour as well as all kinds of stuff. I was getting ideas just walking through aisles I rarely would otherwise.